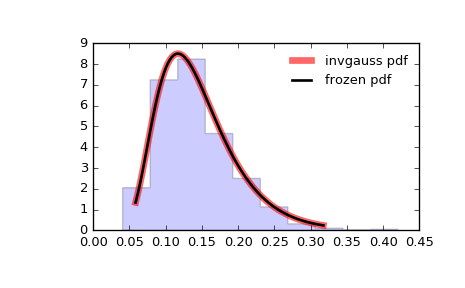 invgauss takes mu as a shape parameter. When mu is too small, evaluating the cumulative distribution function will be inaccurate due to cdf(mu -> 0) = inf * 0. NaNs are returned for mu <= 0.0028.
stats(mu, loc=0, scale=1, moments='mv') Mean(‘m’), variance(‘v’), skew(‘s’), and/or kurtosis(‘k’).